The Ron Joyce Children's Health Centre, park of McMaster Children’s Hospital, opened on November 17th. Something pretty amazing in #kids’ healthcare happened in Hamilton last month, something that was 25 years in the making. For the first time, McMaster Children’s Hospital programs in autism spectrum disorder, developmental pediatrics and rehabilitation, and outpatient mental health for children and youth have come together under one roof, in purpose-built space that is just as beautiful as it is functional. The #Ron Joyce Children’s Health Centre had its official ribbon-cutting on Nov. 17, after 18 months of construction, five years of intense planning and decades of a clung-to vision that the best way to serve young people with lifelong health challenges is in a place created specifically for them. This new facility is part of McMaster Children’s Hospital, but you won’t see ambulances pulling up at the door — this isn’t acute care and there are no beds. This is where children will learn to walk despite physical challenges. 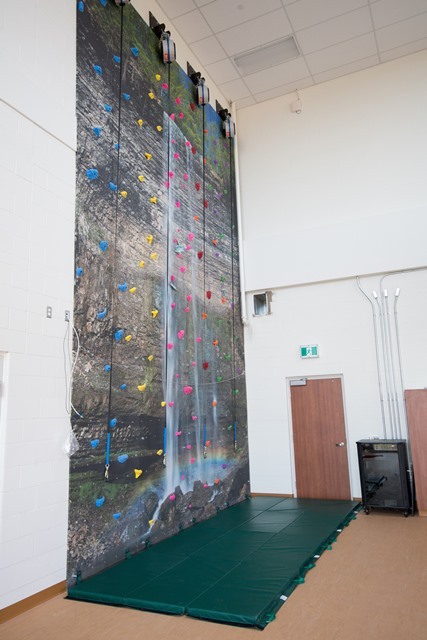 Where kids with autism-related behavioural issues will learn how to cope with school and social settings. Where teens suffering from depression or other mental-health problems can come for restorative therapy. It’s where mothers and fathers learn the techniques to care for their special needs kids, and where we work together to monitor and celebrate every achievement and every milestone. For decades these children’s health care programs were located at Hamilton Health Sciences’ Chedoke site, where they were housed in a series of buildings dating back to the days when Chedoke was a tuberculosis sanatorium. We called the services, collectively, the Child and Family Centre. Also housed at Chedoke, and now moving to the Ron Joyce Children’s Health Centre, were the renowned Prosthetics and Orthotics and Audiology departments, which serve both children and adults. While the quality of the care provided has always been top-notch in each of these programs, the environment for patients wasn’t optimal, and working collaboratively was made more challenging by being located in a variety of buildings. As the president of our children’s hospital — and one of our doctors — I’m excited about this new era in care for children with challenges such as cerebral palsy, Down syndrome, spina bifida, autism, mental-health problems and other developmental hurdles. They now have a treatment facility to call their own, a place designed for them. 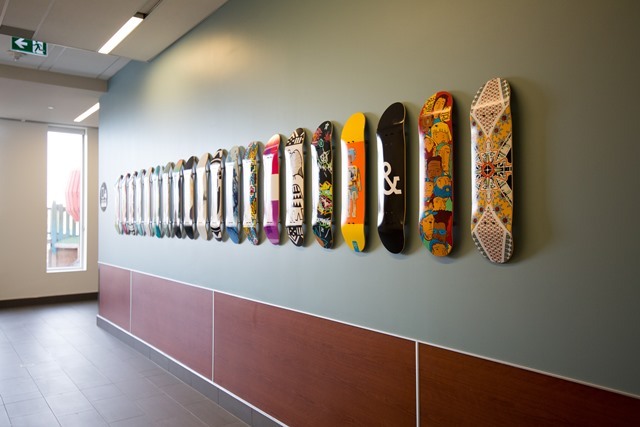 Every detail of the building — from the style of the front entrance to the width of the hallways to the colours of the paint on the walls — was chosen with patients’ needs at the front of our minds. In fact, patients and families were on our numerous working groups that helped shape the design of the building and make it the showcase it is. The new building, with more than 300 staff facilitating an anticipated 70,000 visits annually, gives us room for the future growth that is always on our minds, given the local and regional responsibilities of McMaster Children’s Hospital. And locating it in Hamilton’s North end improves access particularly for families in the urban core. Some years ago Hamilton city council took up the vision “best place to raise a child” to describe our city’s aspirations. I believe our McMaster Children’s Hospital is an integral part of making that vision a reality. Outdoor therapeutic playground themed to represent Hamilton’s bridges, steel mills and waterways. Wheeling track where children testing out wheelchairs or other mobility devices can practice on the 180-metre track. The centre is Silver LEED-certified for its energy-saving features and extensive greening of the exterior property. Almost 200 trees are being planted. 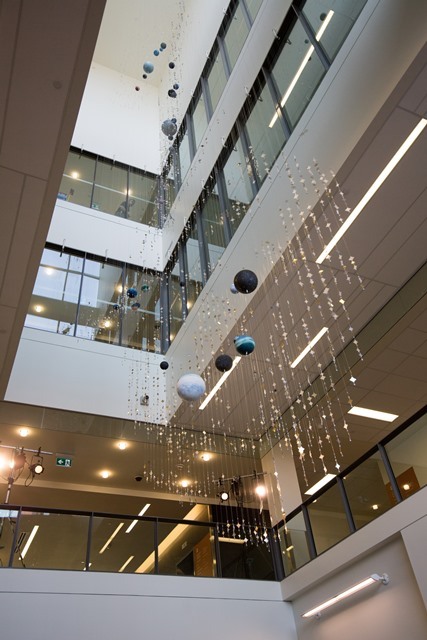 Youth-centred art and sculpture can be seen on every floor of the RJCHC, including the atrium’s multistorey solar system representation. Therapeutic gym with electronic gait measurement and harnesses to give nonwalking children the experience of being on their feet.